Jets fans have spent much of this season wondering if this was the year the giddy ride of Rex Ryan ended, when the team — as NFL teams tend to do — grew older and more complacent and more bloated. The three road losses in a row. The supposed wide-receiver insurrection. The nagging sense that the Jets had caught some friendly breaks the past two years and weren't gonna be so lucky this year. The happy story of the surging Bills. Jets fans had to wonder where this was all going. They had to wonder if this was somehow the end. Then, yesterday, they went out and played their best game all year. Suddenly, the Jets seem like title contenders again. 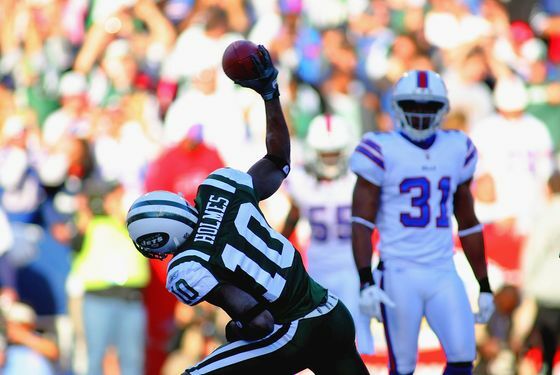 The Jets stomped the Bills in Buffalo yesterday, 27-11. All told, the game wasn't that close. The Jets' defense was dominant in a way that the Jets defense is supposed to dominate, and the running game was at its Platonic ideal, helping the Jets hold the ball for 36 minutes. Mark Sanchez had a rough first half — if it hadn't been for his turnovers, the Jets might have cinched this one by halftime — but rebounded for a terrific second half. The Bills' offense, the reason for all the excitement up there this season (let us not forget their thrilling win over the Patriots in Orchard Park back in September), could do nothing. The city of Buffalo was as thrilled by this team as any in more than a decade ... and the Jets just went and stomped on their necks. And just like that, the Jets are back in first place in the AFC East and feeling cocky again. The other L.T. is talking about the game next Sunday night at MetLife Stadium, against the Patriots, a game that suddenly looks like it might decide not just the AFC champ, but potentially one of the top seeds in the AFC. It would be nice, someday, for the Jets to enter the playoffs with a darned home game. It's early to be talking about that ... but boy, did the Jets look good yesterday. Also, note the Jets' schedule after the Patriots game: at Denver, home against Buffalo, at Washington, home against Kansas City. If the Jets can beat the Pats next week, they could be looking, potentially, at an eight-game winning streak when they travel to inconsistent Philadelphia. (Also, that Week Sixteen game against the Giants is starting to look amazing.) Again, all too early to be doing this. But the Jets are back: the defense, the swagger, all of it. They're gonna be talking like this. Why shouldn't the rest of us? Also: Just for fun, this is what happens when Mark Sanchez lines up at wide receiver. Jumpy little rug-rat, ain't he?